County-seat and principal city of Luzerne county, Pa. Evidence points to 1838 as the date of arrival of the first Jewish settlers, among whom Martin Long, a Bavarian, was the most prominent. Two years later a society was organized for occasional worship, and until 1849 the incipient congregation held its services in various rooms. In August of that year it dedicated its first synagogue under the auspices of Moses Strasser, Isaac Leeser of Philadelphia, and Samuel Isaacs of New York. In 1857 the community was incorporated as the Congregation B'nai B'rith. 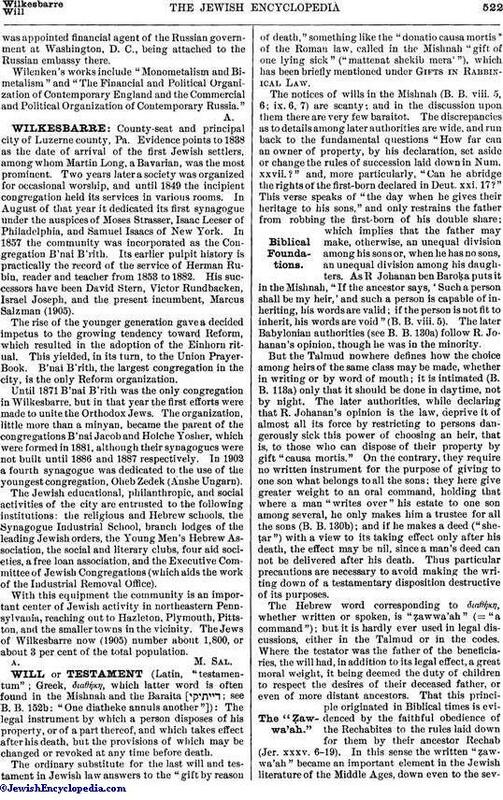 Its earlier pulpit history is practically the record of the service of Herman Rubin, reader and teacher from 1853 to 1882. His successors have been David Stern, Victor Rundbacken, Israel Joseph, and the present incumbent, Marcus Salzman (1905). The rise of the younger generation gave a decided impetus to the growing tendency toward Reform, which resulted in the adoption of the Einhorn ritual. This yielded, in its turn, to the Union Prayer-Book. B'nai B'rith, the largest congregation in the city, is the only Reform organization. Until 1871 B'nai B'rith was the only congregation in Wilkesbarre, but in that year the first efforts were made to unite the Orthodox Jews. The organization, little more than a minyan, became the parent of the congregations B'nai Jacob and Holche Yosher, which were formed in 1881, although their synagogues were not built until 1886 and 1887 respectively. In 1902 a fourth synagogue was dedicated to the use of the youngest congregation, Oheb Zedek (Anshe Ungarn). The Jewish educational, philanthropic, and social activities of the city are entrusted to the following institutions: the religious and Hebrew schools, the Synagogue Industrial School, branch lodges of the leading Jewish orders, the Young Men's Hebrew Association, the social and literary clubs, four aid societies, a free loan association, and the Executive Committee of Jewish Congregations (which aids the work of the Industrial Removal Office). With this equipment the community is an important center of Jewish activity in northeastern Pennsylvania, reaching out to Hazleton, Plymouth, Pittston, and the smaller towns in the vicinity. The Jews of Wilkesbarre now (1905) number about 1,800, or about 3 per cent of the total population.